Financial statements are a set of documents used by Private Investors to analyse their current financial position, as the basis of putting together a financial plan for the future. They are based on the financial statements prepared each year by a company, which are generally known as “the accounts”. Financial statements are documents (usually spreadsheets). Everybody needs it. Financial Statements are the way you stay on track towards your goals. It’s no good thinking that you are doing the right things without regularly measuring your progress. Which order you create your documents in is to some extent up to you. You will need a budget, a net worth statement and a financial plan, and they all need to fit together. Most people would probably come up with a budget first, to make sure they are spending less than they earn. Initially the surplus would go towards clearing any debts (apart from a mortgage) and then building up an emergency cash reserve (of six months of expenses). At that stage, most people would put together a financial plan of the long-term goals they hope to achieve through their annual surplus (their savings contributions). Then they would monitor their progress towards those goals by drawing up financial statements each year. The frequency is optional, and most people start by measuring their progress more frequently than this, but once a year is all you need. Nothing needs to come directly after the financial statements, but sometimes a change of investment strategy will be indicated. As soon as you decide to take control of your financial situation (live within your means, clear your debts, save for the future etc). Hopefully, this will be before you are aged 25, but some people start as late as 45. You need it for as long as you are actively managing your own portfolio. Barring mental incapacity, it doesn’t make sense to take out an annuity before age 75, so you should normally expect to produce annual financial statements each year up to then. Financial statements cost nothing except your time, since you prepare them for yourself. Assuming that you are reasonably well-organised and you don’t have particularly complicated financial affairs, they will probably only take up a few hours of your time each year. There are two mandatory financial statements, and an optional third one. The income statement is a list of all your sources of income, with a sub-total, and another list of all your expenses for the year, with another sub-total. It’s pretty much the same as a budget for the year. 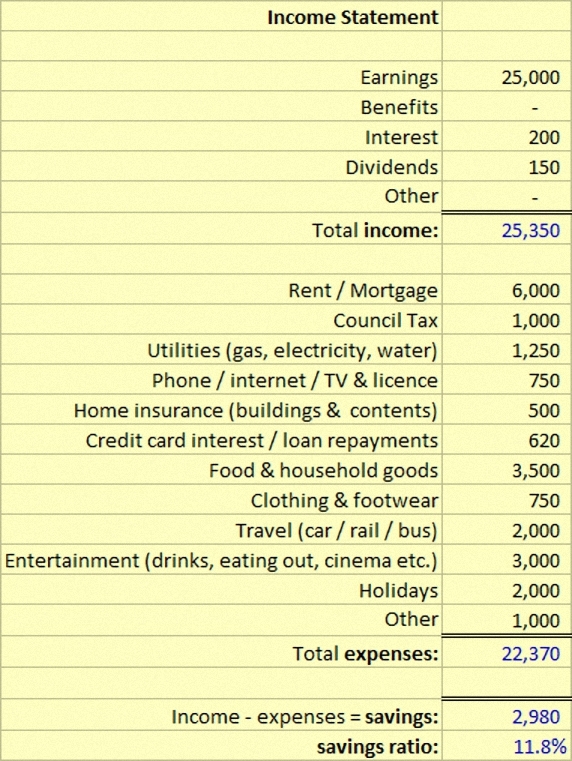 Income minus expenses is your surplus for the year, which can go towards your savings (once you have cleared your debts and built up an emergency cash reserve). If this total is negative, you are spending more than you earn. You won’t be able to save and your debts will mount. 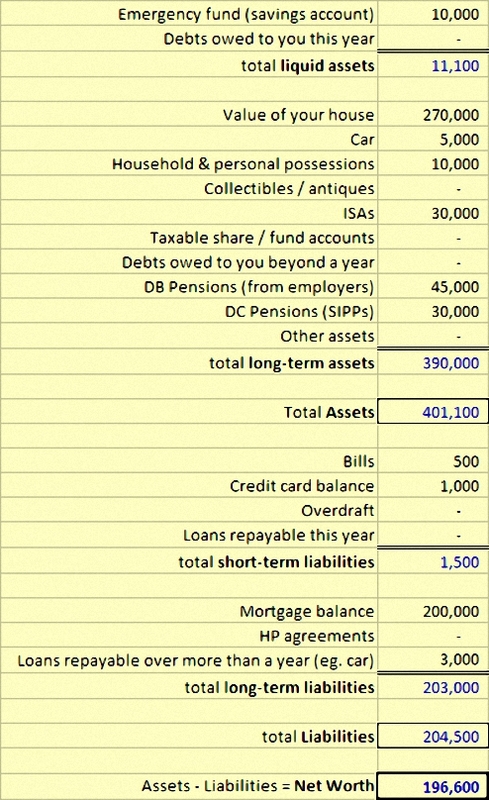 A balance sheet is a list of everything you have (assets) and everything you owe (liabilities). It’s traditionally divided into two sections: one for things that apply to the coming year (liquid assets and short-term liabilities) and one for things that stretch out into the future (long-term assets and liabilities). Total Assets minus Total Liabilities equals Net Worth. Hopefully, this is a positive number and is increasing from year to year. It should also match the corresponding number for that year in your long-term financial Plan. If it falls short, you need to earn more, spend less, or revise your financial goals. The optional third statement is a risk statement. This is a list of all the sources of risk and how you plan to deal with them. 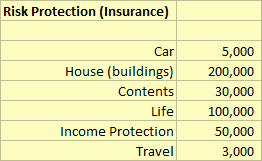 At its most basic level, it can be a list of your major assets (including income sources, like your job and your health) and whether or not you plan to take out insurance against them. Here are some example financial statements for you to crib from. We explain more about how to prepare them here. A bad set of statements would be those that omit information, or use (probably optimistic) estimated numbers. Always complete your financial statements from documents created by independent third-parties (the people you hold money with, or owe money to). There are no brands here, this is a do it yourself product. It’s possible to get a financial advisor or planner to do this work for you, but that would be expensive, and would mean that you didn’t “own the numbers” in the same way that you will if you prepare the statements yourself. The main risk is not preparing statements at all. After that, the second risk is not using real numbers, or leaving some things out. The income statement should match your payslips, your bank account and your credit card statements (yes, you will have to read all of these carefully). There’s no easy check on the balance sheet for “everything you own” and “everything you owe”. On the income statement, it’s relatively easy (if very tedious) to reconcile your numbers to your payslips, your bank account and your credit card statements. On the balance sheet / net worth statement, the best approach is to prepare these statements frequently at first (say once a month for the first year) so that things that are fresh in your memory will be added to the list. Then you only need to remember to add any new contracts and transactions that you enter into. 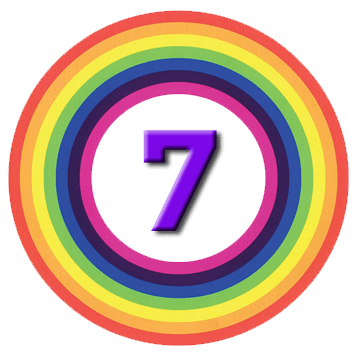 Previous story DeGiro Stockbrokers – Everyday Value?